I'm on a journey of sorts. I signed up for a mastermind on building your business. For months, I've been wanting to do something different. To make a change here at One Foot. To figure out where I'm going and how I plan to get there. To talk confidently and intelligently about what I do, how I help women, and what my real passion is. It hasn't been so simple. I'm a futuristic ideal gal. I like ideas. I think of fresh ones all the time. New products. New topics for One Foot workshops. New things to coach on. The list is endless. My only problem? Three days later, I have a new idea and that old tired, 3-day old idea is left in the idea pile. It's kind of a course mastermind. And we're starting with Fierce Clarity. I don't know about you, but I need some fierce clarity. And speaking of you, I'm wondering about your own need for a little clarity? . Your fierce clarity may look different than mine. Maybe you're looking for fierce clarity when it comes to walking in faith and understanding what God is up to in your life. Maybe you need some fierce clarity when it comes to starting or restarting your health journey and what on earth will keep you motivated this time. Maybe you need some fierce clarity when it comes to a relationship or a conflict you are having or what's next when your kiddos graduate. Wherever you are, I'm betting some fierce clarity will help. What I'm learning is that fierce clarity comes when we start being beautifully ourselves. The woman God made us to be. Embracing the story He is already writing. Finding purpose in the life He has already gifted us with. But, I'm getting ahead of myself. What's a girl to do when she needs a little fierce clarity? Back to my mastermind. Part of our work in Fierce Clarity is to dig inside a little. Who are we on the inside? What are we naturally good at? What do we love to do? And whether you're building a business or building a life, it's important to find clarity on who God made you to be. Embracing our story and loving ourselves in the middle of our story (because God loves us in the middle of our story) is the bravest thing we can do. It also helps us live fully right where we are. Showing up authentically and allowing God to do His best work in the story He is already writing. Recently, I've been training to be an Enneagram coach. If you've never heard of the Enneagram, take some time and explore it for yourself. I'm fascinated by it and can't really get enough of it. It's a personality typing system that helps you explore God you are on the inside, why you do what you do, and how understanding yourself leads to living your best life. And regardless of what I'm trying to accomplish, I know deep down that I want to be the woman that God created me to be. That one-of-a-kind uniquely beautiful person inside and out. It starts with embracing you - quirks and all and learning to love who God created you to be. To be perfectly honest, I've tried to package my dreams into something more palatable for the world. I've tried to shape them into this marketable package. The result? I've had difficulty articulating who i am and what I do. The reality is that your dream could be a new found lease on life through healthy choices, or a new financial future, new friends, a new church, or a new found love of life and faith. If doesn't matter what your goal - personal or business. We need to let our dreams out of hiding. We need to stop trying to make them tamer for others to understand. We need to lean into the things we're passionate about. We need to explore the possibility of what's ahead without editing what's realistic or safe. Ready to explore your dreams? I've got a couple of tools/activities for you to explore. First, if you've never done it - sit down and write a letter to your 16 year old self. Talk about how far you've come and think of the questions your 16 year old self would have had. Give it a day and then read it out loud. To your bestie. Your significant other. Your reading will be way more meaningful than your first draft. Trust me. Give it a few days and then write another letter. A letter to your 75 year old self. A letter as if you've accomplished your big dreams. A letter from the perspective that no dream is too big. A letter from the perspective that God can accomplish what you're dreaming. Get to know your dreams. Embrace possibility. Trade the ones that don't work for the one God has for you instead. 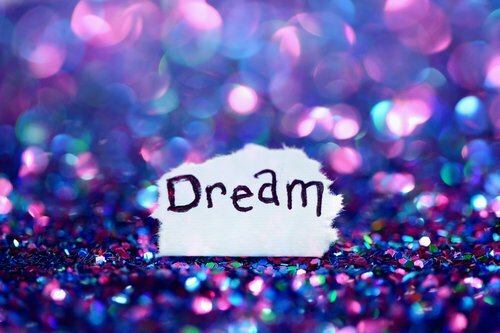 And dream beautifully. On my own journey, I knew i would find my purpose in a ministry job - helping women find faith and courage and freedom. Guess what? Well, there's two guess whats. One, I eventually got that job after years of making my friends miserable with my whining. (I'm not proud of it, but it's a fact) - only to realize that it was a first stop on my purpose journey. Two, my purpose was found when I chose to find purpose in my everyday moments. That means today. And what I've discovered is that the pathway to purpose. The pathway to being beautifully you starts with finding purpose and meaning in our moments right now. Today, when you go to work. Today, when you choose healthy options over the drive-thru. Today, when you say no today so you can have a brighter tomorrow. Today. Where you are. With your people. Being beautifully you.